Partly cloudy. 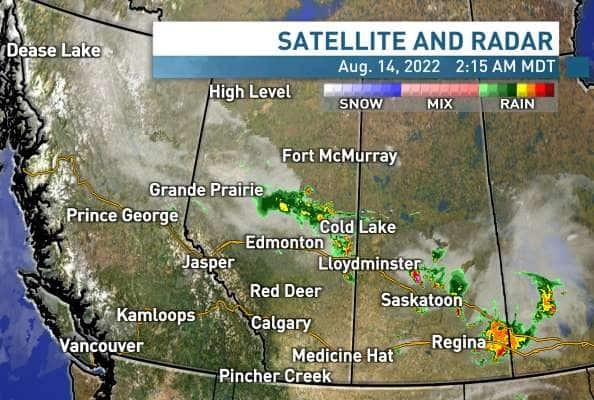 30 percent chance of showers near the British Columbia border overnight. Wind west 50 km/h gusting to 70 except gusting to 100 in wind prone areas overnight. Low 7. A mix of sun and cloud. 60 percent chance of showers near the British Columbia border. Wind west 50 km/h gusting to 70 except gusting to 100 in wind prone areas in the morning. High 18. UV index 7 or high. Periods of rain becoming mixed with snow overnight. Snow level 2800 metres lowering to valley bottom overnight. Rainfall amount 5 to 10 mm except snowfall amount 3 cm over higher terrain. Wind west 50 km/h gusting to 70 becoming north 30 gusting to 50 early in the evening then light near midnight. Low plus 2.